With more than 100,000 Christmas travelers delayed by a what’s being called “cat-and-mouse” drone flying game with police, American’s are wondering could this happen to them, and what are the real dangers of off-the-shelf drones? Macatawa Unmanned Systems, a commercial drone retail company, and a award winning drone security company, President Jeremy Latchaw states “unfortunately these types of incidents have happened in the past and will continue to be a thorn in the everyday American’s side until better counter measures are approved by both the FAA and FCC”. President Trump signed the FAA Re-authorization Act of 2018 which begins to add Counter-UAS system guidelines for agencies to deny rogue actors the ability to conduct operations like those done at the Gatwick Airport, but the roll out of these protocols are only starting right now and the effectiveness has not been proven yet. The FAA also rolled out the Low Altitude Authorization & Notification Capability or LAANC program. This system grants airspace access to certified pilots that are conducting operations within regulation near airports. This process allows the FAA to quickly approve pilot operations, while ensuring pilots are limiting risk to manned aircraft traffic. Major Small Unmanned Aircraft Systems (sUAS) Manufacturers began in 2018 to place measures in their software to protect certain areas that “lock” the aircraft, whereby the drone will not take off without the pilot doing an override protocol that includes providing proof of their authorization to fly within the locked location. Locked locations would include airports like London’s Gatwick Airport. These manufacturers are also lobbying the government for their new countermeasure systems like DJI’s AeroScope, which can leverage the frequency of the controller and aircraft to triangulate the signals, tell what the “license plate” of the aircraft is then law enforcement can have the company look up what operator was signed in to the aircraft at the time to determine who the pilot was. Most of the concepts in development for countermeasures to deny rogue drone actors the ability to breach into areas like London’s Gatwick Airport are good, they do not take into account an entire air defense strategy and actors will be able to easily access vulnerabilities in the future. There are two forms of air defense, they are active and passive. Passive includes detection, and other security measures to include camouflage. Most C-UAS systems right now fall into the passive realm, they identify the aircraft moving into an area roughly 2 miles from the system. Some of the drones themselves have a 5 mile capability, allowing operators plenty of space to avoid detection, or being caught by authorities. Active defense would include shooting down aircraft, either with a jamming device or kinetic ballistics. As stated by the authorities in London, there is a high amount of collateral damage potential, especially in dense populated areas. Jamming could be a better option, however; one never knows what the drone could be carrying, plus the FCC legally does not allow jamming of aircraft. With the FAA re-authorization act, some federal agencies can now utilize this capability if they have the tools to implement on site. 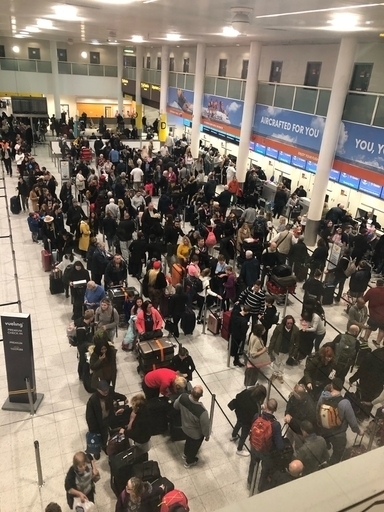 In the coming future more incidents like this one at London’s Gatwick Airport will happen, with limited response capabilities law enforcement in the United States will respond in the same fashion that they did at Gatwick. Government officials will need to speed up the processes in developing C-UAS capabilities and getting those capabilities to the operators to protect key infrastructure and airports as soon as possible. Officials need to ask both industry and government agencies to develop a comprehensive plan to avoid such incidents.